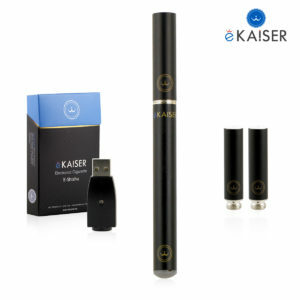 Slim, lightweight and portable E-cigarette, created by eKaiser. So small, that it fits in every pocket. Comes with an elegant packaging box, even smaller than a Cigarette Packet. Elegant design, available in Black or White, perfect for every vaper. With its "real cigarette" size, the "ash glow effect", caused by the LED light, and the Automatic Inhale Activation, eKaiser makes your Vaping more realistic.